Published: Jun 15, 2016 to ? Fie, first princess of Deeman, finds herself isolated and stranded in the foreign Kingdom of Orstoll all by her lonesome—effectively having been wed off as a dowry gift in accessory to her sister, Princess Fielle's marriage. Trapped and isolated in a small back garden that once used to be a storehouse, Fie lives her days without purpose, and eventually without food—after the only member of her entourage, the chef, resigns. 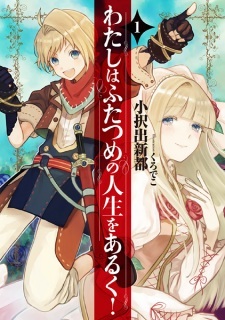 Just as Fie was about to give in to despair, she finds a pamphlet advertising a Squire's test for the Royal Knights of Orstoll—beginning her journey of friendship, hard work, and guts, along with masquerading as a boy to walk her second path in life. Watashi wa Futatsume no Jinsei wo Aruku! has been published digitally in English as Walking My Second Path in Life by J-Novel Club since December 14, 2017. Not an Isekai story, surprising after reading that title. Haha. Story: Okay so this King and Princess falls deeply in love and want to get married. Thing is, the unpopular sister of the Princess, is given to the king as well, as part of the deal. Her name was Fie. Due to misunderstandings, everyone hates Fie and she's locked away. So would anyone miss Fie if she ran away? Thus the second path of her life begins, as a knight-in-training. While pretending to be a boy! Art: It's pretty good. But it's a light novel, so art is a tiny part of the book. Characters: The Main Character is an interesting girl. She's not gonna let herself get beaten by others, and will fight for her freedom. Along with her work friends, it's nice mix of characters that makes this story easy to follow. Though it has the typical jerk characters that you see in shoujo stories. Enjoyment: So, why didn't I enjoy it? I don't like the dramatic "twists" in how it reminds me of shoujo stories. Why do I keep mentioning shoujo? It's just how the story resembles shoujo manga with some story events and characters. Like how the King just happened to like Fie, when pretending to be a boy. But he hates the real Fie, why? Rumors. I liked the story as a whole. If they only toned down the drama and focused on Fie being a knight-in-training it would be a lot better.